The size of a small whale, Ron Paul’s Charlottesville blimp has been lighting the night skies along Rio Road and, as of today, Fontaine Avenue. The white blimp—asking who the heck Ron Paul is—was trucked from its home base on East Rio Road late today to its new home in the sky near the Interstate 64 intersection with U.S. 29 just south of Fontaine Avenue. The lighted blimp adds a new dimension to the surging Paul effort and appears not to be floated on hot air, but that other Washington staple—a shot of noble gas. The GOP’s Paul, a Texas congressman and libertarian, is the first of 12 presidential candidates on the Feb. 12 Virginia primary ballots, six in each party, to get his blimp floating over the outskirts of the liberal enclave of Charlottesville. That blimp is no longer on the outskirts. In a brilliant marketing move, the blimp's mover and shaker, Jack Faw, placed it right in the heart of Charlottesville for New Year's Eve. The blimp is parked near the corner of Main Street and McIntyre-Ridge Road. Lit up, it can be seen for quite a distance from all directions. Faw says Central Virginia's going to see a lot of that blimp. "Staunton has already asked. Harrisonburg has asked. Lynchburg's interested. Richmond is interested. I-64 in Fluvanna County, some of our members down that way would like to have it." 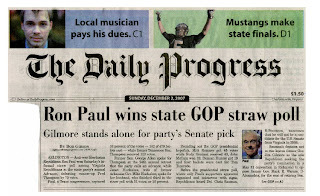 The 72-year-old Paul has raised $19 million so far this quarter and he won the Virginia Straw Poll earlier this month. Still, the Texas congressman lags significantly in the national polls. Faw special ordered the big balloon online and says it was worth it to take the campaign to new heights. "I found a dealer and a manufacturer in California and with a lot of phone calls over a couple days is all. By the second day I had ordered it and paid for it," shared Faw. Faw plans to take the balloon to different locations across Albemarle County. He says he'll put anywhere anyone will let him. Faw won't tell us how much he spent on the balloon or the rest of his Ron Paul paraphernalia. He'll only say it's the price he's willing to pay for freedom. With thousands of people streaming into Charlottesville tonight for First Night Virginia, to see the fireworks, or to dance the night away at Club 216, the Ron Paul blimp will be seen by many people heretofore unfamiliar with the presidential candidate from Texas. No doubt the question, "Who is Ron Paul?," will be on many lips this evening. Talk about being lit up for New Year's Eve! The Capitol One Bowl Tuesday was set to pit Florida against Michigan. Besides their teams in the big game, the two states have one other thing in common: both are holding presidential primaries in January. At least one candidate has taken advantage of having all those voters in one place. The Ron Paul campaign planned to put a blimp up over the Citrus Bowl Tuesday before the game, so more than 70,000 fans attending the Capital One Bowl would be able to see it pass by the arena. Presumably, a blimp flying over the stadium will also end up on TV screens across the country, and seen by far more than the 70,000 people in the stands. And CFNews13 was first with the story. Benazir Bhutto was one of the most authentic political leaders I have ever met. Our single meeting lasted only about two hours, but in that brief time I came to know Mrs. Bhutto, the former prime minister of Pakistan who was assassinated by a terrorist earlier today, as warm, intelligent, and fervently dedicated to the restoration of democracy in her homeland. What's more, she was both modest and unassuming despite her clear intellectual and emotional strengths. Her modesty was apparent, if through nothing else, then through the setting of our meeting. A colleague and I were invited to meet with her in the living room of a Fairfax County townhouse. She graciously offered us tea, which she served herself; there was no entourage present, no servants, no hangers-on. In the adjacent kitchen, a supporter made dinner while a couple of toddlers watched cartoons on television. Our conversation was periodically punctuated by giggles from a few feet away, and the atmosphere was enhanced by the aroma of a homemade Pakistani meal in the oven. Through the course of our conversation, Bhutto displayed a firm grasp of international affairs and of U.S. government policy toward the Middle East and South Asia. Her commitment to democracy and her refusal to concede that the Muslim world lacks the capacity to participate in modernity were apparent. She was quiet and reflective yet firm in her well-informed opinions. Although Pakistan is not my regular "beat" as a writer or consultant, I had been following Bhutto's election campaign with particular interest. Just yesterday, I was part of a team that launched a web site for Bhutto's Pakistan People's Party to raise campaign funds world wide. Less than 18 hours ago, I was distributing a news release that contained an optimistic statement from her with regard to her party's January 8 election prospects. Needless to say, waking up to the news this morning of Benazir's murder was emotionally numbing. My colleagues and I are still trying to process the information, much of which arrived in chaotic bits and pieces through CNN, Fox News, and MSNBC. 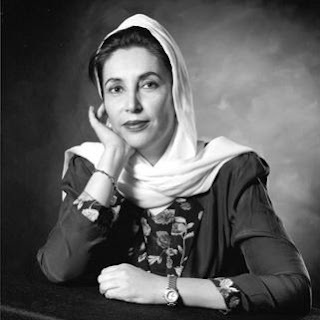 Benazir Bhutto -- the first female leader of a government in a Muslim country, Harvard-educated, Western-oriented, wise, and warm -- was truly a martyr for democracy. Her loss is a loss for her family, for the people of Pakistan, and for the world. It doesn't come from one of the key states of Iowa, New Hampshire, or South Carolina, and it's not strictly an endorsement. Still, an editorial in Sunday's Colorado Springs Gazette comes as a very strong recommendation for Ron Paul as a choice for Republican presidential primary voters. Ron Paul, the libertarian-oriented and commendably antiwar 10-term Texas congressman and Republican presidential candidate, has in some ways been the most interesting phenomenon of the early going in the campaign, although a case can be made for former Arkansas Gov. Mike Huckabee. Paul’s Internet-oriented supporters are not only fervent, they have supported him with record-breaking amounts of money, most notably in two single-day fundraising “bombs” of more than $4 million and $6 million respectively. Few observers would have predicted last summer that Paul, little known outside Texas, would be a financially viable candidate long after former Virginia Gov. James Gilmore, Kansas Sen. Sam Brownback and Colorado Rep. Tom Tancredo had dropped out. In Congress, Paul has consistently voted against tax increases and against spending that he doesn’t believe is authorized by the Constitution. As a small-government proponent who also advocates a more modest non-interventionist foreign policy, he speaks to what many voters used to think the Republican Party stood for. His positions also appeal to a substantial number of younger people. 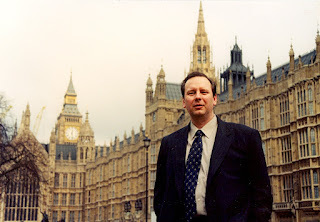 The Paul campaign is already the most significant pro-freedom mass movement of recent times. It’s time to find out if it brings him enough votes to at least give him a seat at the table when future policies are determined — and perhaps more. This morning on Meet the Press, despite hectoring questions from Tim Russert -- to be fair, it is Russert's job to be hectoring, and one would be disappointed in him if all he did were to lob softballs -- Dr. Paul more than held his own. He kept on message, coming back again and again to the need to cut spending and to shrink the government to Constitutional size. It is no wonder he is gaining praise and garnering more support around the country. How Many Words Does a Picture Speak? There has been a minor brouhaha in the blogosphere. This tempest in a teakettle involves several bloggers who are trying to smear Ron Paul with the "racist" label, based upon a photo of him and a white supremacist leader. The photo was taken at an event attended by hundreds of people. 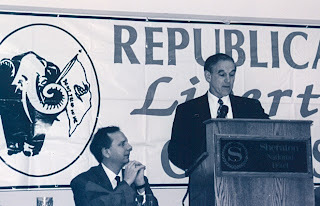 Both the Daily Kos and Little Green Footballs, among prominent bloggers, state that this photograph provides dispositive proof that, since Ron Paul appears in the same frame as a white supremacist, Dr. Paul must himself be a white supremacist. By that logic, any two people appearing in a photograph together must hold the same views, have the same aspirations, and perhaps even share the same occupation. Let's test this assumption, which I believe constitutes nothing less than jumping to conclusions. According to the logic described above, I must be an astronaut. Your eyes do not deceive you. That's Ambassador Joseph Wilson (husband of Valerie Plame) with Congressman William "Cold Hard Cash" Jefferson of Louisiana. Why do they look so happy? What shenanigans are on their mind? 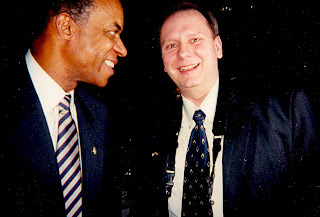 Yep, that's me with the same Congressman William Jefferson. Both of us have a satisfied look on our faces. I wonder where our hands -- and pockets -- are? I guess that makes me a Richmond Democrat. 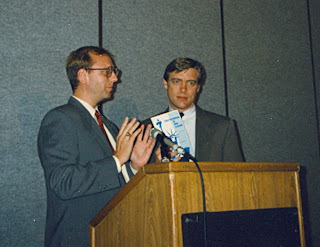 Speaking of Democrats, what am I doing in this photograph with then-Congressman Tim Penny of Minnesota? I guess that makes me a Vikings fan. That's me eating sushi at Yo! 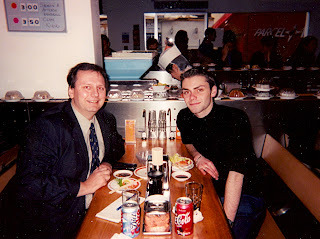 Sushi, a Covent Garden restaurant, with actor Daniel Brocklebank (Shakespeare in Love , Merlin ). That must mean I'm a Japanese-speaking, classically-trained, British actor. The photo proves it! 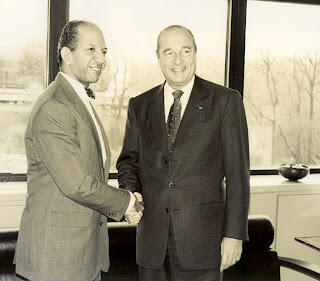 That's then-D.C. Mayor Anthony Williams with former French President Jacques Chirac. 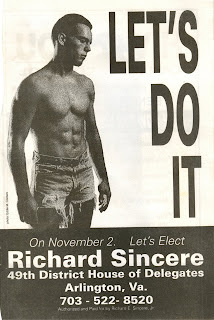 Since Chirac was once mayor of Paris, then -- logically, remember -- Williams must have been mayor of Paris, too. After all, they're in the same photograph. 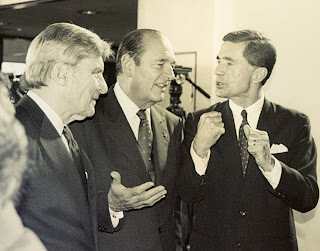 That's Virginia Senator John Warner on the left, with President Chirac in the center and former Senator Chuck Robb on the right. 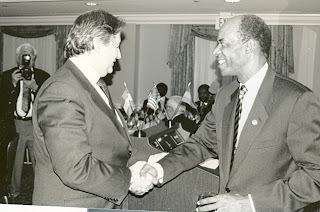 Notice that both Chirac and Robb are talking with their hands. Obviously, Chuck Robb is French. Q.E.D. Ron Paul is from Texas. 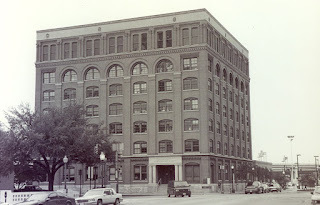 So is the Texas Book Depository. 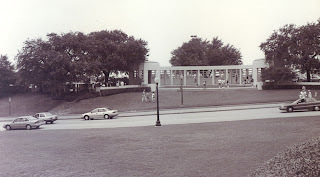 If Ron Paul wasn't in the building, he must have been on the grassy knoll. Logic demands it. 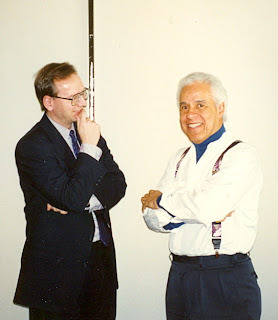 That's me with Congressman Paul. Since I'm gay and Ron Paul is in the same photograph as me, following the logic of Daily Kos and Little Green Footballs, there is only one conclusion: Ron Paul is gay. I wonder if Tim Russert will ask about that on Meet the Press today, when Ron Paul is his featured guest. The news broke today on Coy Barefoot's radio program on WINA-AM: Charlottesville City Councilor Dave Norris will be our new mayor. Norris himself announced on the air this afternoon that Mayor David Brown will pass the gavel, after two terms, at the next scheduled City Council meeting on January 7. Brown and two new councilors, Holly Edwards and Satyendra Huja, were sworn in yesterday. They were elected in November. Norris was elected in May 2006 along with Julian Taliaferro. If you didn't hear Coy's show, you read it here first: Norris has not even posted this news to his own blog yet, although he indicated interest in the job last month. The State Board of Elections met in Richmond this morning and drew lots for the ballot positions of the candidates of the Democratic and Republican parties for their respective primaries on Tuesday, February 12, 2008. The candidates who will be listed first on the ballot are Ron Paul for the Republicans and Barack Obama for the Democrats. Regardless of where they stand in the polls on Feb. 12, Democrat Barack Obama and Republican Ron Paul will be atop their parties' presidential primary ballots in Virginia. The State Board of Elections on Thursday selected the order in which the names will appear on the ballots for the February primary. The names were drawn at random from sealed envelopes in a bowl. Obama, a U.S. senator from Illinois, is followed on the Democratic ballot by Ohio Congressman Dennis Kucinich, New York Sen. Hillary Rodham Clinton, New Mexico Gov. Bill Richardson, Delaware Sen. Joe Biden and former North Carolina Sen. John Edwards. Paul, a Texas congressman, is followed by Arizona Sen. John McCain, former Tennessee Sen. Fred Thompson, former Arkansas Gov. Mike Huckabee, former New York Mayor Rudy Giuliani and former Massachusetts Gov. Mitt Romney. 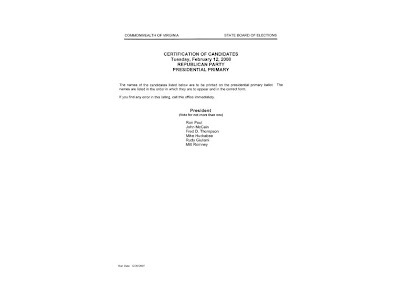 Update: Here is the official certificate issued by the State Board of Elections, listing the candidates and their position on the ballot. Order now and have your packages shipped fast. 3 p.m. PST (time varies by item) on Thursday, December 20. 1 p.m. PST (time varies by item) on Saturday, December 22. Taking a cue from that, I thought I might revisit some of the books that I have discussed here over the past year or so, since blog readers tend to be readers first and surfers second. For example, in June, under the heading "Scenes from a Debate Season," I quoted a long passage from Gary Alan Fine's book, Gifted Tongues: High School Debate and Adolescent Culture -- which might make a nice gift for anyone who enjoys the new Golden Globe-nominated film, The Great Debaters , starring (and directed by) Oscar-winner Denzel Washington. When I Knew is a compilation of memories from gay men and lesbians from all walks of life (though a disproportionate number of them, it seems, are somehow connected to the entertainment industry), with a specific reference to the identifiable moment of their discoveries of being gay. It's a quick read, with only a handful of entries longer than a page. Many of the authors are well-known as adults and their childhood memories are sweet, bittersweet, sometime campy, sometimes wry, and always illustrative of what it is like to grow up gay in a straight world. Brian Doherty summarized, in about ten minutes, his 800-page retrospective, Radicals for Capitalism: A Freewheeling History of the Modern American Libertarian Movement. syndicated radio talk-show host Neal Boortz spoke to about 200 fans and signed copies of his new book, Somebody's Gotta Say It . Pope Benedict XVI, in a new book scheduled to be published next month, condemns the West for exploiting the Third World. News reports about the book -- called Jesus of Nazareth and excerpted earlier this week in the Italian newspaper Corriere Della Sera (which happens to be owned by Rizzoli, the publishers of the book) -- do not indicate whether the pontiff similarly condemns the rulers of Third World countries for their kleptocratic practices that serve to keep their subjects in poverty while the government elites party like the wealthy title character in the parable of the Rich Man and Lazarus. Somehow I doubt he does, since -- whatever the Pope's merits as a theologian and rhetorician, which are considerable -- he lacks an understanding of basic economics. Rabbi Jacob Neusner, a professor of the history and theology of Judaism at Bard College, explains how a 14-year-old book of his ended up playing a central role in a new book by Pope Benedict XVI called Jesus of Nazareth . In my 1993 book “A Rabbi Talks With Jesus ,” I imagined being present at the Sermon on the Mount, when Jesus taught Torah like Moses on Sinai. I explained why, for good and substantial reasons based in the Torah, I would not have followed Jesus but would have remained true to God’s teaching to Moses. Much to my surprise, Pope Benedict XVI, in his new book “Jesus of Nazareth,” devotes much of his chapter on the Sermon on the Mount to discussing my book. “More than other interpretations known to me, this respectful and frank dispute between a believing Jew and Jesus, the son of Abraham, has opened my eyes to the greatness of Jesus’ words and to the choice that the gospel places before us,” the pope writes. He ties this exchange of ideas to a lamentably lost tradition of disputation between religions, a tradition that was lively in the Middle Ages but began to decline during the Renaissance and nearly disappeared during and after the Enlightenment, when theories of religious tolerance gained ground (a good thing in comparison to the persecutions and pogroms that preceded it). Here is a unique look at the Harry Potter effect. — Book sales (Nielsen BookScan) - Since 1998, when Nielsen began measuring book sales in the United Kingdom, the six Harry Potter books have sold more than 22.5 million copies in the UK alone. In the United States, the Harry Potter titles published after 2001 have sold more than 27.7 million copies. — Box Office sales (Nielsen EDI) - Combined, the first four Harry Potter films have grossed more than $3.5 billion worldwide. The first film, “Harry Potter and The Sorcerer’s Stone,” is the fourth all-time highest grossing film worldwide. — Advertising (Nielsen Monitor-Plus) - In the U.S., ad spend for all Harry Potter branded merchandise (including books, movies, DVDs and other promotional products) totals $269.1 million from 1998 to date. Outside of the U.S. from 2000 to date, $119.3 million was spent on total advertising for all Harry Potter branded merchandise in Canada, Germany, Italy, Netherlands, Norway, South Africa, Switzerland, and the U.K.
Changing directions completely, one cannot forget "Mormon Beefcake," sparked by a Washington Post story about a new 2008 calendar featuring hunky (male) Mormon missionaries. The 2008 Men on a Mission Calendar generated a lot of buzz and has turned into a best-seller. Whether it is an effective proselytizing tool remains to be seen. There are plenty more books (including plays) that I discussed this past year that are not mentioned here. To my surprise, this has turned into a retrospective of this year's blogging, although it may seem a bit mercenary. Really, I will not complain in the least if, while reading this, you choose to buy something from one of my advertisers -- if not Amazon.com, then TLA Video's online store (see "Christmas Shopping List"). Or, if you're really pleased, there's always the tip jar. Green Chri$tma$, indeed -- but a merry one, too, followed by a happy new year! By sheer coincidence, today is also the third anniversary of my first blog post. It was a Friday evening and I had nothing better to do. Now look where it's led. 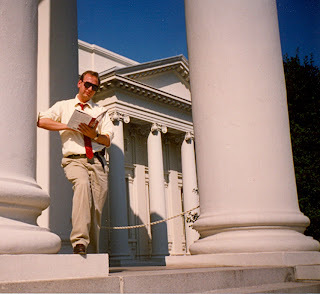 I swear, however, that I was not influenced by the date that Jorn Barger came up with the word "weblog." In fact, until a few minutes ago, I never visited Robot Wisdom (and then only to get the correct link). But you have to appreciate these accidents of history. 'Deck the hall' is a very free translation of a Welsh dance-carol traditionally sung at New Year's Eve. It belongs to the distinctive Welsh tradition of canu penillion in which merrymakers would dance in a ring around a harpist. Verses, either extemporized or remembered, would be thrown in by the dancers in turn with the harp playing the answering bars now made up with the 'fal, la la's'. Those who failed to come up with a new verse would fall out of the dance. 'Nos Galan' is first found in Musical and Poetical Relics of the Welsh Bards published in 1784 by the harpist Edward Jones but the melody almost certainly goes back before that. Despite the fact that Jones heads the song 'Nos Galan' (New Year's Eve) the text in his version is a love song. In fact, the tune seems to have carried many different words before becoming specifically associated with New Year festivities.... The original Welsh New Year carol seems to have been turned into an English Christmas song in the latter part of the nineteenth century as part of the Victorian re-invention of Christmas. The first known appearance in print of 'Deck the hall' is in The Franklin Square Song Collection edited by J. P. McCaskey in 1881. The authorship of the English words, which, apart from the reference in the third verse to the passing of the old year and the coming of the new, bear no relation to the Welsh original, has never been established. Numerous variations are found in all three verses. The third line of the first verse is sometimes rendered 'Fill the mead cup, drain the barrel' or 'Fill the beer up, drain the barrel'. In the second verse the first line is often 'See the flowing bowl before us' and the last 'While I sing of beauty's treasure'. Several versions of the song extol singers at the end of the first verse to 'Troll the ancient Christmas carol'. In the third verse, the third line is often rendered 'Laughing, quaffing, all together'. Essentially this is a carol where the words don't really matter too much. The great thing is the tune and all those fa, la, las which according to the erudite editors of the New Oxford Book of Carols seem to have begun as substitutes in the original dance tune when no harp was present. It is not known what steps were danced to the original Welsh carol. I would really like to hear someone sing the line, "Laughing, quaffing, all together." What's that old saying? "If it laughs like a deck, and it quaffs like a deck... then deck the halls." The downtown mall in Charlottesville was the site of a Bill of Rights Day commemoration. This annual event is sponsored by the Jefferson Area Libertarians. 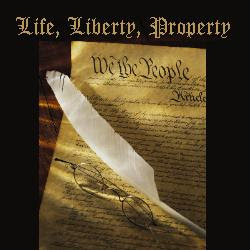 This year, the speakers were John Munchmeyer, who introduced James Curtis (who led a recitation of the text of the Bill of Rights with the assembled citizens) and Jim Lark, and then later delivered some remarks of his own. Here, in two parts, is a video of the 2007 Charlottesville Bill of Rights Day celebration. Speaking of patriotic commemorations, today also marks the 234th anniversary of the Boston Tea Party. For those who want to celebrate that historic event, visit the campaign web site of presidential candidate Ron Paul, whose supporters have organized a "moneybomb" to coincide with the anniversary. (The last such moneybomb, on November 5, raised a record $4.2 million in 24 hours.) Thousands of small-dollar contributions can add up quickly. Do your part to break another record! Forty years ago tonight, my father brought home our family's first Super-8 millimeter movie camera. I would like to say that I have the ability to post the film-to-video transfer of that first night's product, but -- unfortunately -- the film remains in the can and has never been put on VHS or any other form of video. Over the next 15 years, however, my family and I put hundreds of events on thousands of feet of film. (A roll of Super-8 film was about four minutes long.) The bulk of these reels of silent film is typical family fare: birthdays, holidays, visits to the zoo, vacation trips, drunken barbecues. Once I reached junior high, I appropriated the camera (and its successors -- we upgraded more than once) for school projects. My favorite of those projects was posted to YouTube earlier this year, but I never bothered to bring it here to share it with this blog's audience. In my junior year of high school, I took an English class called "Humorous Literature," which was taught by Mr. Gregory Meuler, who later became principal of Marquette University High School and, at the 150th anniversary celebration this year, was given a distinguished alumnus award. Several of us Webster Club members took the class at the same time (Mr. Meuler was an assistant debate and oratory coach) and undertook a film project which, for reasons that will become obvious to viewers who watch through the end, is entitled "A Brief Encounter" -- alluding to the great David Lean film, although the real inspiration came from Monty Python's Flying Circus, which was then the most popular public television program among adolescent boys. (Not the only public TV program favored by that demographic, however: Benny Hill was carried by PBS affiliates in those days, too, although his work never really appealed to me -- too many scantily clad women, I suppose.) The allusion also anticipated Alan Bennett's The History Boys by 30 years. The "screenplay" (such as it was) was co-written by myself and Dan Barboriak; we also shared directorial responsibilities. The cast included our classmates Steve Illa, John Jansky, Scott Murphy, and Tim Schally. We shot the film, guerrilla-style, on the MUHS campus, on the grounds of the Veterans' Administration hospital in Wood, and on the parking lot of Milwaukee County Stadium (the predecessor of Miller Park and once the home of the Braves and the Brewers). 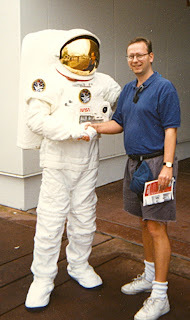 So, in honor of four decades of holding a moving picture camera in my hand, I give you "A Brief Encounter." By the way, although this video recording has a soundtrack derived from Mussorgsky's "Pictures at an Exhibition," I discovered early on, while showing the original Super-8mm film to various audiences, that the soundtrack from Stanley Kubrick's Barry Lyndon has a near-perfect overlay to the action in "A Brief Encounter." Sort of like Dark Side of the Moon and The Wizard of Oz . Try it for yourself. You may be surprised by the coincidence of image and sound. 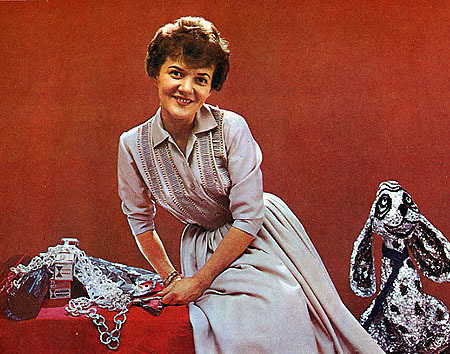 heed the advice from "Conny of Alcoa," the official home-design hostess of the Aluminum Company of America, circa 1961. "Decorated with plain ornaments and inexpensive spotlights, aluminum trees develop a spectacular ethereal beauty," Conny counseled in a booklet boasting photos of bouffant-haired women in shirtwaist dresses and stiletto heels, earnestly intent on their aluminum trees. I remember aluminum Christmas trees. Conny was right: they did possess "ethereal beauty." More than that, they were a respectable replacement for "live" trees, which had a tendency to shed needles and become fire hazards (especially in the days of big, bulky bulbs on frayed electrical wires). At the time, artificial trees that could "pass" as real trees were rare and expensive, if available at all. Developments in plastics manufacturing didn't make realistic fake trees possible and economical until the 1970s. Blame Mom: If only she hadn’t trashed the family’s aluminum Christmas tree, circa 1965, you’d be making quick bucks on eBay. Oh sure, its dilapidated box was coated with decades of attic dust, and she’d been trying for 40 years to get one of you kids to take it (and the rest of that stuff up there!). Start boo-hooing if your fake tree was pink or gold, because then you really could’ve cashed in this holiday season. Kitschy as it seems today, the aluminum tree in all its artificial glory was the proud centerpiece of many a baby boomer Christmas celebration. The standard version stood 6 feet tall, perfect for a 1960s ranch-style home. The coolest feature was the electric color wheel that magically changed the tree’s silver hue to blue, red, green and orange-gold. The vintage aluminum Christmas trees sought by collectors today were introduced in 1959 by Christmas tree manufacturers, Aluminum Specialty Company. 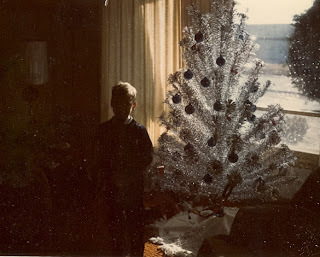 Soon after their debut, aluminum Christmas trees were rapidly introduced by a variety of other firms and they became one of the staples of the modern American home during Yuletide throughout the 1960s and well into the Seventies. Aluminum Christmas trees have been characterized as having a design, look and feel of sophistication. In fact, when the trees were launched, many observers and the manufacturer itself called them the 'Space Age Christmas trees'. The silvery color and the unique structure and appearance made the aluminum trees different and more appealing to many people. the industry leader was the “Evergleam” made by the Aluminum Specialty Co. in Manitowoc, Wis. From 1959 to 1969, the company sold more than 1 million Evergleam trees throughout the U.S., and this amazing number doesn’t reflect the tens of thousands sold by dozens of smaller manufacturers. Complete with color wheel, the artificial trees required no potentially dangerous lights and therefore could be marketed as “safer.” In reality, the aluminum trees were extremely flammable, made of foil-covered paper with heavy cardboard skeletons. The standard Evergleam was brilliant silver, but they were also fashioned in brassy gold, stylish pink and groovy candy-cane colors, in dimensions varying from tabletop size to 8-foot giants. Deluxe models featured branches finished with end-pieces resembling half a maraschino cherry and were designed with motorized stands that allowed the tree to revolve slowly, circling every one to two minutes. 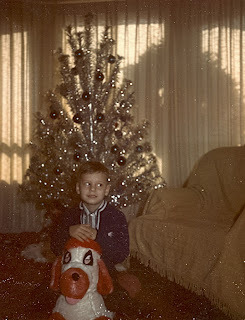 While going through some boxes of old photographs and archival material earlier this evening, I came across two Polaroid pictures of a 5-year-old me and the aluminum tree my mother erected soon after we moved into a new home just days before Christmas. Note the blue balls. To be perfectly truthful, there is some "ethereal beauty" in those Jetsons-era Christmas decorations. I'm not sure I'd lay out big bucks on eBay to buy one, but if one fell into my lap (metaphorically speaking), I would be happy to put it in my living room for the holiday season.